Do you have a dog that LOVES to be outside with you, but would rather lounge in the shade? We've got the perfect solution for your dog's comfort! Our outdoor gazebos for dogs allow a dog to enjoy shade and protects them from the direct rays of the sun. Your dog won't feel claustrophobic in the DogZebo! Because of our open-sided unique design, your dog will have a 360 degree view of everything that's going on in the yard. 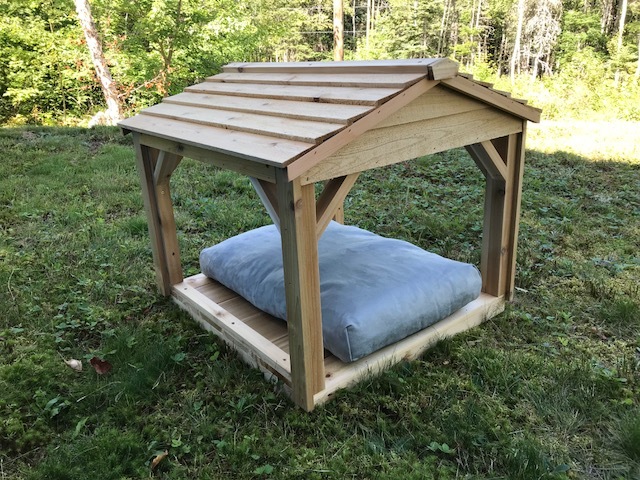 Whether your dog is watching you work in the garden or just hanging out in the backyard by himself, Rover will love the opportunity to relax in the comfort of his own cedar gazebo. What are the dimensions of the DogZebo - Outdoor Gazebo for Dogs? The floor size of the outdoor gazebo for dogs is 28 inches by 26 inches. The peak of the gazebo roof is 17 inches off the ground. How comfortable is the DogZebo? You've watched how happy your dog is laying on the deck when the shade is on that side of the house? What if you could give him that level of shade and comfort all day long? But just to make sure Rover is extra comfy, you can buy our optional cushion for the floor of your dog's gazebo by checking the optional cushion box before adding the DogZebo to your cart. What breeds is the DogZebo best suited to? Don't see your breed? That's okay! If your dog measures around 15 inches or under at the shoulders they can enjoy the DogZebo - our Outdoor Gazebo for Dogs!